The deepest lake in the United States is not, as one might assume, one of the enormous Great Lakes, but a very deep lake located in south-central Oregon that was formed by an ancient volcano. Approximately 7,700 years ago, the volcano Mount Mazama collapsed, forming a deep and isolated caldera. The depression slowly filled with water and now has a maximum depth of 1,949 feet. The lake is notable for its deep blue color and water clarity as well as the fact that no rivers, springs, or other similar sources replenish the lake. The entire volume (4.49 cubic miles) of the lake is replenished via precipitation. Over the course of roughly 250 years, the entire volume of the lake is replaced as moisture is lost to evaporation, but returned via rain and snow. Speaking of wintry conditions, the lake has a rather particular curiosity thanks to the cold. 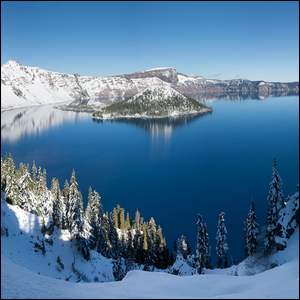 Crater Lake contains a large floating stump known as the “Old Man of the Lake”. The stump has, due to the low temperatures slowing down its decomposition, been bobbing and traveling all over the lake for over a century and is, because of its elusiveness and notoriety, a bit of a local celebrity.